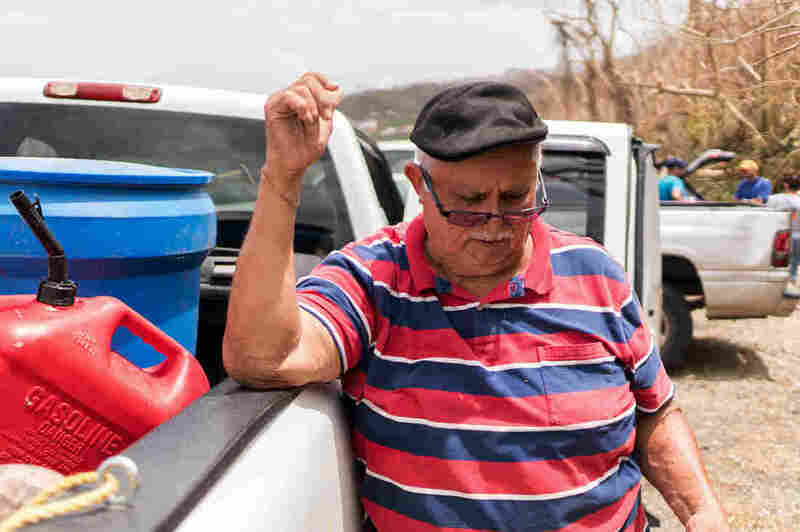 Puerto Ricans, Armed With Bottles And Buckets, Seek The Water To Survive : The Two-Way The damage left by Hurricane Maria has disabled running water for many in Puerto Rico. People are driving to mountain springs to fill empty soda bottles and heading to rivers to do their laundry. "I can live without power," says Wanda Ferrer. "But I can't live without water." Ferrer was one of many people filling up at a government spigot in Toa Bajo, west of San Juan. 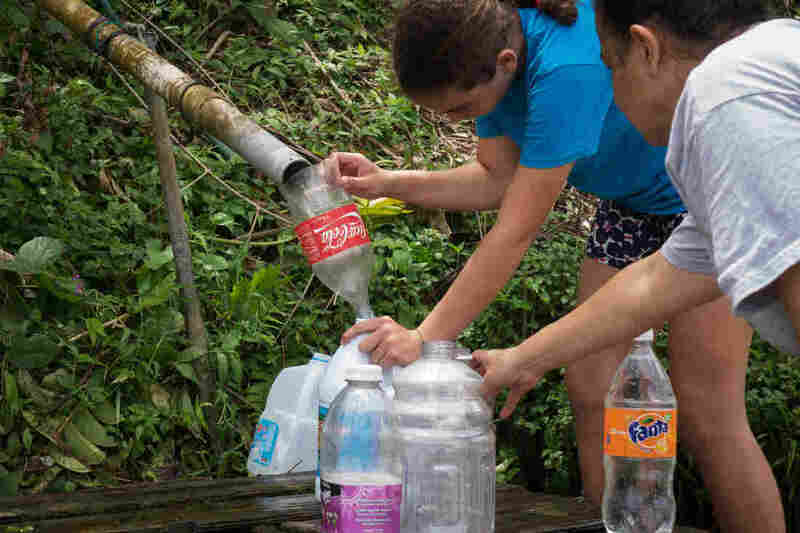 Communities across Puerto Rico have lost running water as a result of the widespread power outages from Hurricane Maria, and it's not clear when it will be restored. Bottled water isn't easy to get. Some stores have water in stock, but the lines are massive. And not everybody can drive to a grocery store; cars were damaged in the storm and gasoline is tight. Some municipalities have distributed water from trucks, though many residents in the interior say they haven't seen one. 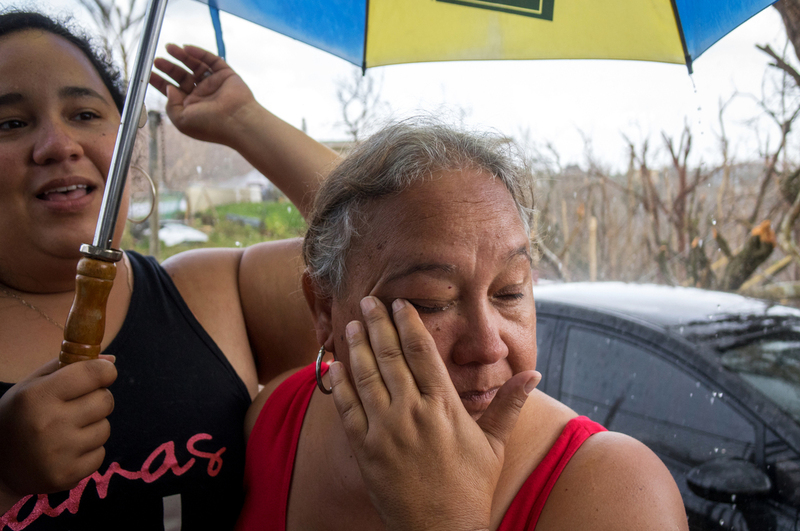 Veronica Vargas (left) and her mother, Martha Viera, rode out the hurricane in their house on the top of a mountain ridge, near Aibonito in central Puerto Rico. Many people are living off stockpiles, like Martha Viera and her daughter Veronica Vargas. They rode out the hurricane in their house on the top of a mountain ridge, near Aibonito in central Puerto Rico. The eye of the storm passed right over them. "When we started hearing all of the windows bursting, we just — we have a bathroom that's in the hallway and it has no windows," Viera says. "We were in there about 13 hours." But they still had water in their storage tank, plus several cases of bottles from the grocery store. And Vargas' husband, Juan Pablo Santos, had tied two 55-gallon barrels to their roof with wire and filled them up before the hurricane. "With the gravity, through the hose, it comes down, and it's like you have running water," Vargas said. They've gone through one of those barrels already. They think they'll be OK with their supplies — but no one is sure how long it will be before the water comes back. 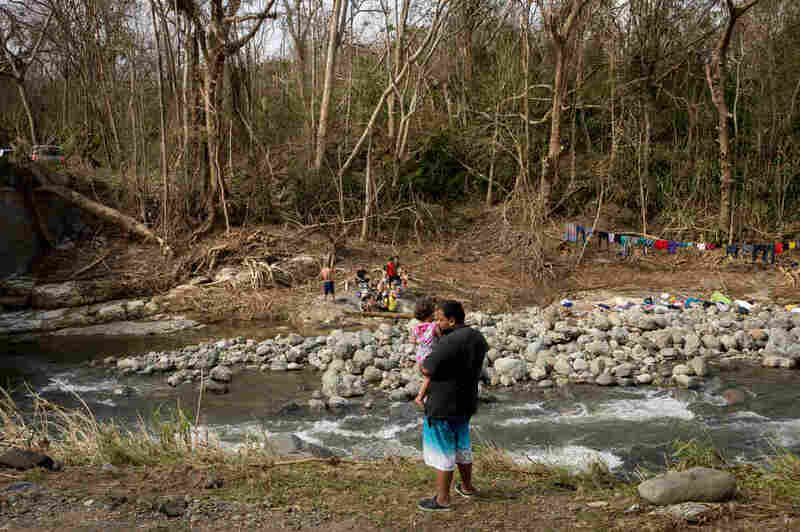 Other residents of Puerto Rico's interior are filling up at local springs, where PVC pipes stick straight out of the hillsides along expressways and little roads. They're a regular source of water for some residents here, storm or no storm. He's 76 and says this is his first time getting water like this. But Alberio says he needs water "for everything ... to drink, to bathe, to wash up, to clean the house" so he traveled half an hour to this spring. People fill plastic containers with water from a stream in Cayey, Puerto Rico. Bottled water isn't easy to get. Some stores have water in stock, but the lines are massive. "There's no water anywhere else," she says. "Except the river," she says, referring to the large Rio Cañas. "And that's dirty, dirty." Even nonpotable water is in high demand. 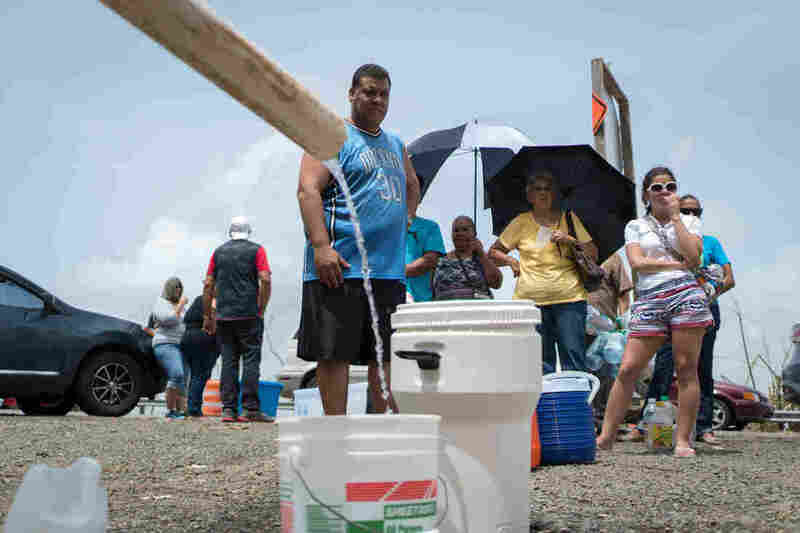 In Coamo, a small town in southern Puerto Rico that was hit hard by the storm, people lined up to take water from a municipal tank where it has been sitting stagnant for days. Local officials were on hand to warn them that it wasn't drinkable and should only be used for cleaning. This river, the Calabaza, is much cleaner-looking than the muddy Rio Cañas. Local residents are bringing laundry in buckets to wash on the banks; their neighbors' clothes are already drying on rocks or makeshift lines. Other people hop in to bathe. "You have to take a bath with cups," he says, demonstrating a sponge bath. "And it's so cold. You can't waste gas on making it warm." 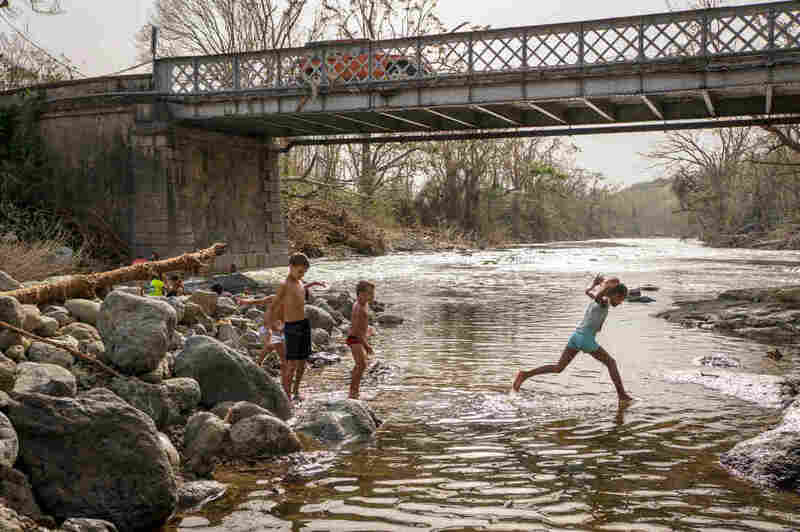 The river is better, he says — but it's more dangerous, too. The current is fast. "You have to be careful," he says. "I'm not a good swimmer." The river feels festive. The sun is shining, but it's not too hot here in the mountains. Children laugh as they jump in the water. 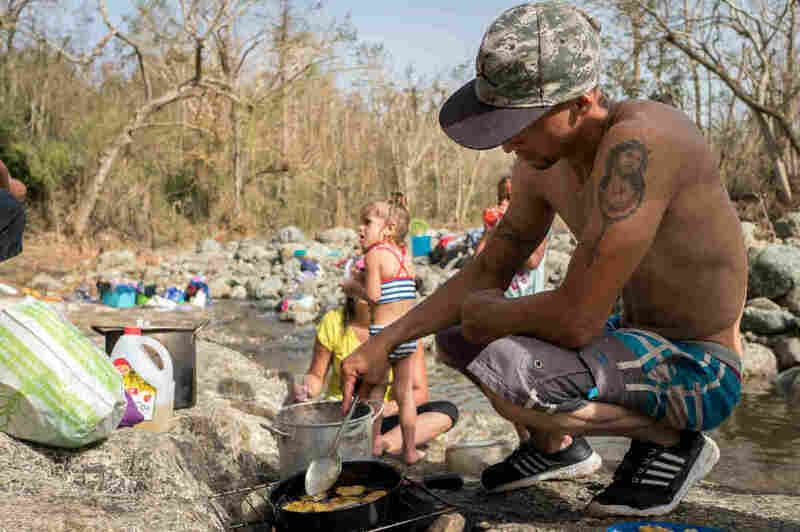 On a pan supported by rocks, over a wood fire, two men are making tostones — fried green plantains. But the desperate conditions that brought people here aren't far from anyone's mind. Modesto Hernan de Velez tears up as he says that nearly a week after the storm, he still hasn't had any contact with his daughter, Maria Raquel Maldonado, who lives in Maryland. He looks out over the river with a distant expression. "When I was a child, I would come here with my mother," he says. "This same location, to visit friends and talk and have a good day." Edwin Rivera is standing on the opposite bank. "I lost everything in my house," he says. "I was looking for my pictures. But I lost everything." He posted some of the photos on Facebook. He hopes he can find them there — once he has power and Internet. 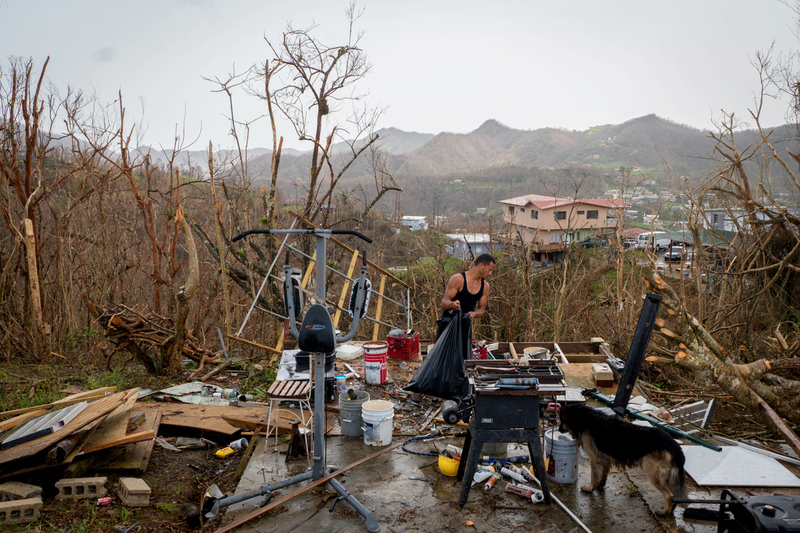 In the meantime, he is staying at his father's house and has been working to clean up the remains of his own home in Aibonito. It's hard work. He came to the river this afternoon to eat tostones, enjoy the sunshine and get away from that labor. "I'm here to take a rest," he says. NPR's Greg Allen and Marisa Peñazola contributed to this story.